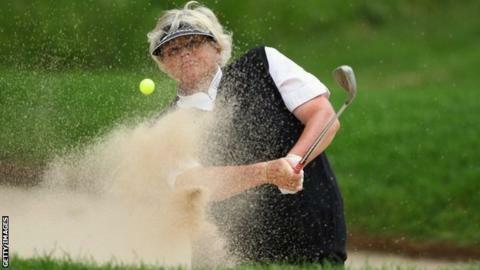 Four-time major golf champion Dame Laura Davies said a historic vote on female membership could be the catalyst to inspire a new generation of players. The Royal and Ancient Golf Club has agreed to allow women members for the first time in its 260-year history. "This is a big moment. Girls will see it as a viable option as a sport to play," said Briton Davies, twice winner of the LPGA tournament. But she called for extra television coverage to help create role models. "When I was 15 you weren't even allowed to walk in front of the window of the clubhouse." The 2,400 Royal & Ancient (R&A) members were asked to vote via a postal ballot and a "yes" vote was confirmed on Thursday evening. Women could already play on the Old Course at St Andrews in Scotland, where the R&A club is based, but they could not join it. Davies, who has been a professional for nearly 30 years, said: "Women's golf is so big now that it's only right that at the home of golf, women should be members there. It's good news all round. "Times move on and I think all of them probably realise that it's a bit ridiculous in this day and age. "This is a historic and significant vote for the running of golf. With the sport returning to the next Olympics it would have been wholly inappropriate for one of the game's leading bodies to be intrinsically linked with a club that has discriminatory membership policies. "It is a big step for a 260-year-old institution but one the game needed. It may influence Open venues like Sandwich, Muirfield and Troon to follow suit. "In practical terms it makes little difference to the vast majority of female golfers, but helps the game portray itself in a more inclusive light." "I spoke to someone from the LGU (Ladies' Golf Union) recently and they said numbers are down in women's golf clubs. "Maybe the vote will raise awareness and women will start thinking 'Oh, I thought that was a male-orientated sport'. "You've got to remember some people haven't even played the game and this might just give them the encouragement to try it." Davies said the change "had been a long time coming" but that the sport was gradually becoming more inclusive, and recalled two incidents from earlier in her career. "Myself and Julie Brown were brought in front of the secretary because we had walked in front of the men's members' lounge at one club. We weren't members there and were in a junior competition. "We were young girls and absolutely panic-stricken about the rules. Golf in those days was a lot more stuffy than it is now." Davies said there were restrictions on female players at the Curtis Cup match at Muirfield in 1984. "We weren't allowed in certain parts of the clubhouse and yet we were playing in one of the biggest amateur women's tournaments you could possibly play in. It's one of those things, but was a bit weird, I have to say," she said. Statistics show that the vast majority of golfers are male, but Davies said the emergence of young female stars, and increased coverage, could help women's golf grow. "I'd love to see a hugely strong British representation, not just on the world pro tour but in the amateur ranks, really good young players coming through," said the 50-year-old. "I know the recent ones like Charley Hull and Georgia Hall have just come through - they are going to be hugely successful over their career, I'm sure. "The biggest thing for me that holds back women's golf is the lack of television coverage. If women's golf was more mainstream on television, there would be a massive influx of young people. "I think there's huge opportunities. There's so many golf courses, and it does take quite a bit of time to play, it is time consuming, but you can go down the range, hit some shots, have fun with your mates over nine holes - for me it is the greatest game."